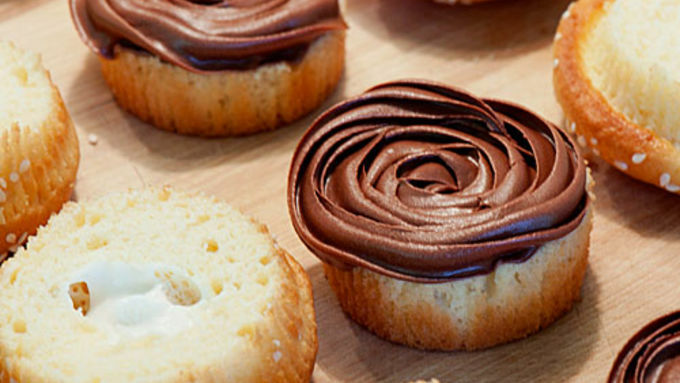 Remove the paper wrapped from the cupcakes and slice in half. Place the coconut in a bowl. Add 3 to 4 drops green food coloring and mix well. Set aside. Pipe a circle of chocolate frosting on each "bottom bun". Sprinkle the colored coconut on the chocolate frosting. Top with red and yellow frosting to simulate ketchup and mustard. 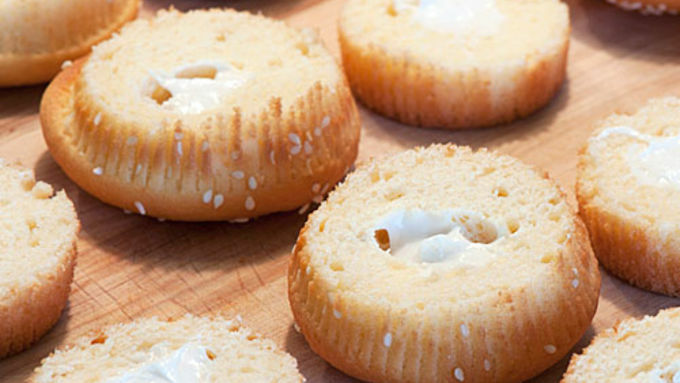 Gently place cupcake tops on each frosted bottom half. Refrigerate until about 20 minutes before serving time. Ever had a Juicy Lucy? We all know there’s nothing better than a burger. Unless it’s a Juicy Lucy, which one-ups a regular burger as it is two patties stuffed with a hot gooey, cheesy center (Beware: That first bite can be dangerous!). It sounds odd to the uninitiated, but the Juicy Lucy is truly a burger graduated to the proverbial next level. 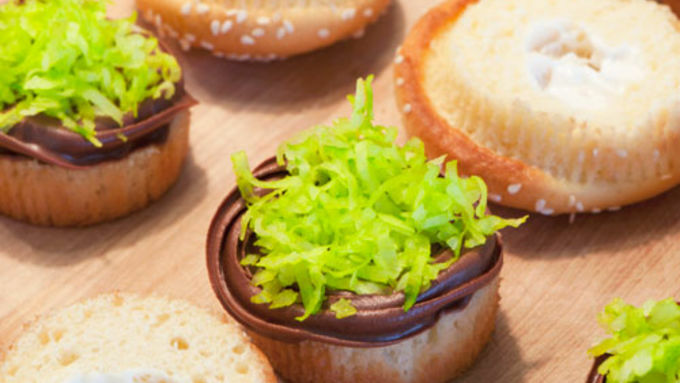 So it’s easy to see then, how the new Fun-da-middle cupcakes, with their ingenious creamy filling, could take the Burger CUPCAKE to a completely new and previously unimagined realm. 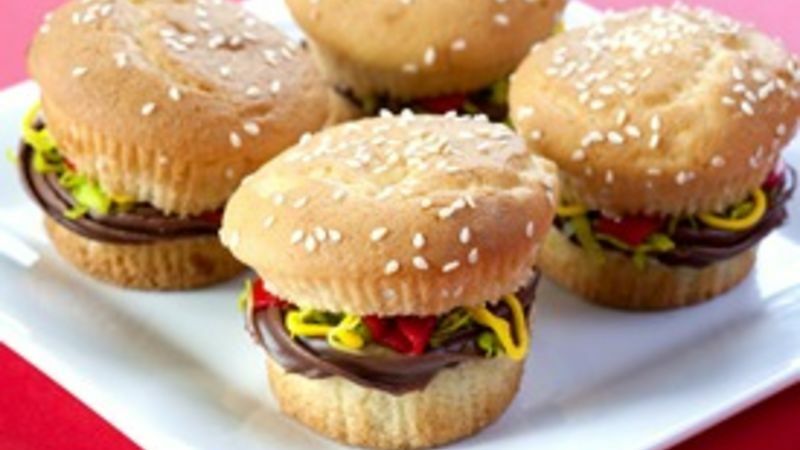 The “Juicy Lucy” Burger Cupcake is everything that you would expect in its less-adorned bretheren – a faux “bun” studded with sesame seeds and a stylized application of various icings and colored coconut for visual tomfoolery. The filling adds both the “juicy” and the “lucy”! 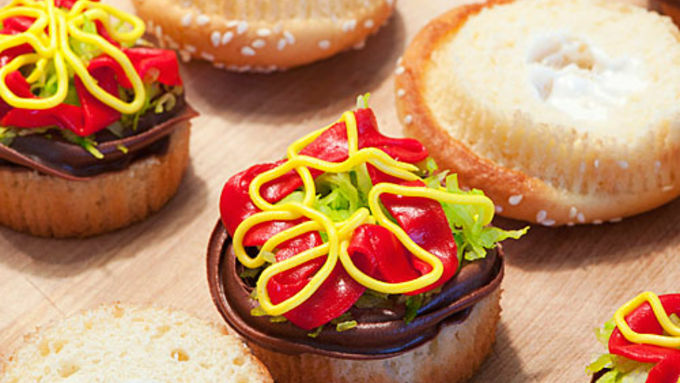 So let’s ask the question a different way - what could be more fun than a tiny burger cupcake? 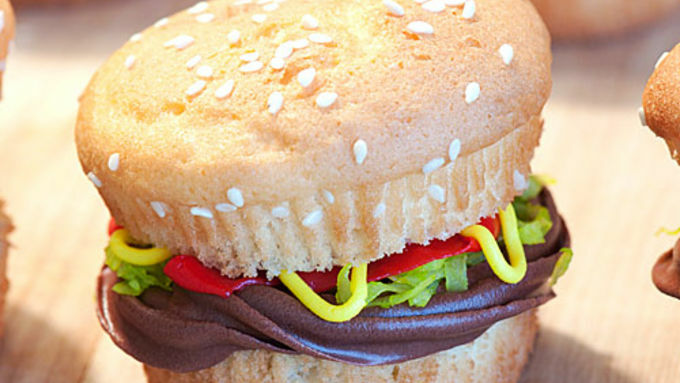 A “Juicy Lucy” Burger Cupcake, that’s what! The best part – this is super easy. Prepare the Fun-da-middles according to package directions (I used the yellow cake/white filling mix.). Sprinkle with sesame seeds. Bake as directed. Then assemble! Hope you enjoy! More unique cupcakes to try!